After hearing so many stories about how unspoiled and beautiful the scenery is in Cornwall, I couple of years ago I decided to spend my August bank holiday by doing a road trip there. Even if the weather was not great and it rained for most of the time, I still enjoyed the raw beauty of Cornwall. As the August bank holiday is fast approaching and the weather seems to be great currently, I have written down my perfect 3 days Cornwall itinerary. Based on my own experience and recommendations, I have created a balanced plan that allows you to see as many places as possible in one day, but also leaves enough time to enjoy them. I have to be honest, no matter what option you choose, it takes a lot of time to get to Cornwall. This is because the infrastructure in the area is not that great and the speed limit is lower than in other parts of the UK. Coming from London, you could take the train from Paddington Station towards Penzance or the coach from Victoria towards Truro. It takes an average on 5:30 hours to reach Penzance by train and 9 hours by bus. However, once there the buses are quite slow, and you won’t have much independence from traveling to all the places you want to see. This is why I suggest either go by car or, if you are just visiting England, rent one. You can find some great deals on cheap car rentals on Holiday Extras, that’s where I usually rent all my holiday cars from as they are very transparent with the costs. 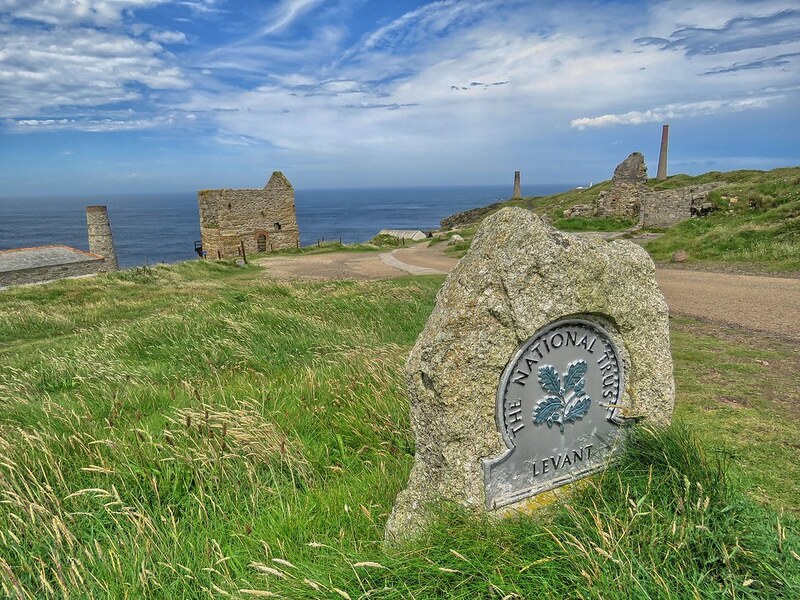 If you want to explore as much as possible of Cornwall, try to choose a central location as your base, easy connected to a main road. I based myself in Truro, which was a merely half an hour’s drive away from most of the places I visited. Falmouth can be another great option as well. You can find some lovely holiday rental homes on Blue Chip Holidays. Not really in Cornwall but on the way to, Dartmoor National Park is definitely worth a visit. Even if slower, I suggest driving straight through the national park and not avoid it. There are plenty of cute little villages to stop at and buy a cup of coffee, or have lunch at the local pub. I chose to buy some bits and bobs from a convenience store in Moretonhampstead and then have a picnic further up the road, next to a rock formation. I have also stopped at Postbridge for a break and to do a short walk along the East Dart River. From the Postbridge Village Hall I also bought a few postcards, for my collection. 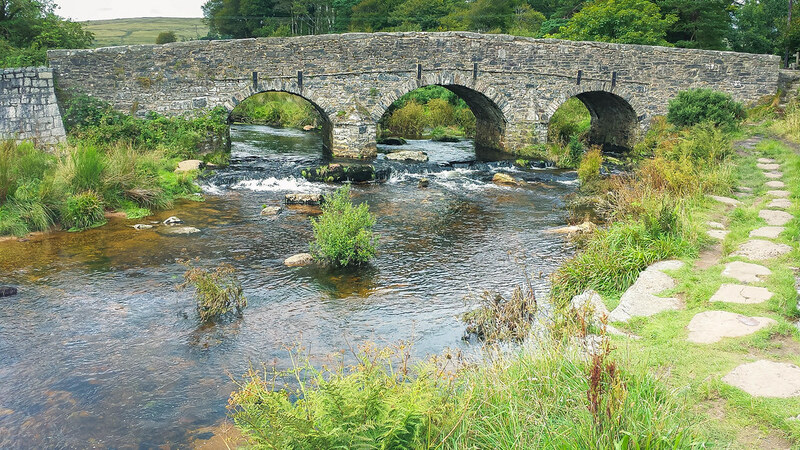 You can spend a full holiday just exploring Dartmoor National Park, visiting its tiny villages and hiking along the varied landscape of forests, rivers, moorlands, wetlands and tors (rock formations). In Dartmoor National Park you will find many ancient monuments dating all the way back in the Early Neolithic and the Bronze Age. If you are passionate about ancient history don’t miss visiting the Merrivale Bronze Age ceremonial complex, the Grimspound, the Holne Moor reave system or the Hound Tor medieval village. Looe was my first stop in Cornwall. Initially not on my itinerary, I couldn’t not stop here and enjoy a stroll along the river, after I crossed the stone bridge and saw how cute the town looks like. I enjoyed walking along the promenade and looking at the beautiful houses decorated with flowers, as I was passing by them. On the river, boats were returning from the sea filled with fish and a trail of seagulls squawking above. Even if the weather wasn’t the best and the first drops of rain were just about to drop, the town still looked charming. For summer visitors, you should know that Looe has a beautiful golden sand beach with waters in which is safe to swim. Often you will see parents with children sitting on the Victorian bridge connecting the two sides of the city with lines in their hands and buckets next to them, catching crabs. 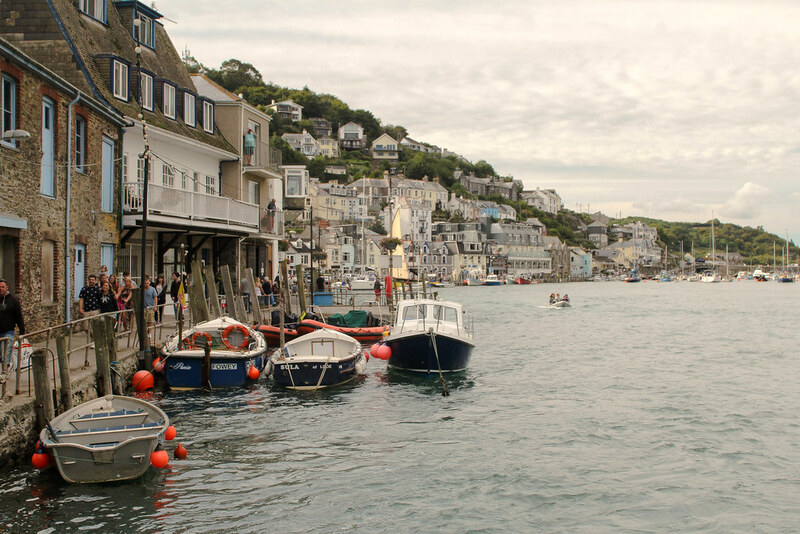 The town prides itself on the fresh fish, so having lunch or dinner at one of the many cafes and restaurants alongside the harbour is a must. When I first started to research my trip to Cornwall I stumbled upon pictures of this little village with a harbour that looked like just the perfect place for a pirate ship to dock in. It was the first place I have added on my Cornwall itinerary, even if it was a bit out of the main way. When I arrived, it didn’t disappoint! The village, which I later found out that was famous in the past as a smugglers haunt, is charming, with narrow streets and white buildings. It’s situated in a bay surrounded by the beautiful coast, in an area of outstanding beauty. It is connected to Looe by a five miles long footpath crossing stunning natural beaches and clifftops. Polperro is boosting of tiny, independent and quirky shops selling local products and handicrafts. Chatting with one shop owner, whilst buying some fudge, she mentioned how all their business comes during the summer months, as in winter not many people visit and it’s not worth opening the shop. And how she struggles trying to sell as much as possible. I felt very sad for her, especially that all the goods she was selling were homemade and they didn’t cost much. I wondered how she managed to survive in the winter months without an income. When you visit Polperro, make sure to stop by the Blue Peter Inn, a fantastic old pub with creaky stairs and low wooden ceilings. I ordered the catch of the day, which included not one but three (!!!) fish with a side of potatoes and a yummy salad. For drinks I went local and ordered a tasting paddle which included four different quarter pint ales, in order from the lightest to the darkest. The bill? About £15! Be aware that there the parking lot in Polperro is outside of the village, a merely 10-15 minutes’ walk downhill and costs a minimum of £4 for three hours, and then it goes up with every additional one. Do not try to drive down the road into the village as it gets narrower and narrower and you will encounter a barrier at the end. Turning your car around will be very difficult. Unless you are a resident, you will have to park at the top. Did you know that Marazion is Cornwall’s oldest town? Mainly known because of the getaway to St Michael’s Mount, Marazion is a cute little place worth visiting as well. It was two beautiful sandy beaches with amazing views over the bay, clean and safe for children to bathe in the sea at. Marazion is a very quiet town, if you don’t count the nearby field used for parking, for St Michael’s Mount visitors. You can download the Town Trail ebook from Amazon and do a one hours walk around the centre of the town, learning about the town and admiring its old buildings. You can also pick up the book from the local museum or from the Keepsakes in the Square gift shop. There is no store or restaurant chain in Marazion, so when you have dinner at a pub, when you get a coffee from a café or when you pop into the store to buy a postcard, you are supporting the local community and their small businesses. The town has also been declared “Plastic Free Community”, which means that all local businesses have stopped providing the option of throwaway plastic items in their venues and provide alternative solutions, such as paper bags or takeaway cups with lids that are compostable. There are no plastic straws in the town either. You have probably heard about Mount St Michel, in France, which is a very famous attraction and receives visitors from all over the world. 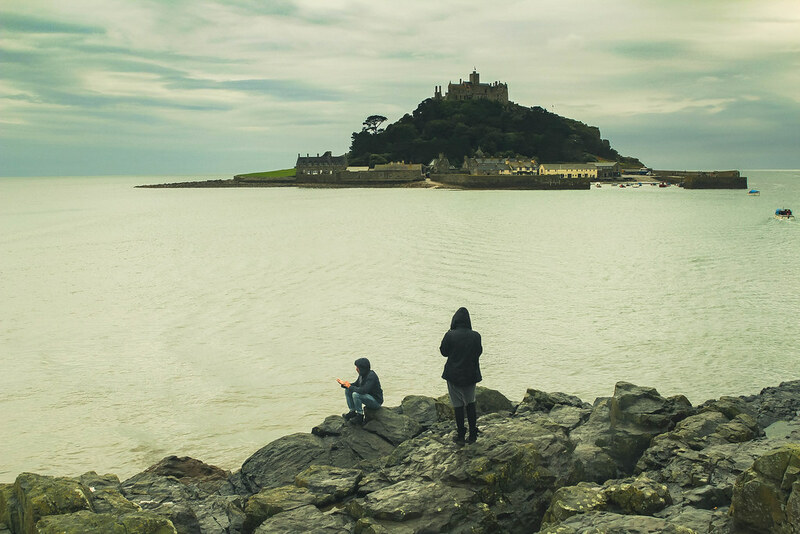 But how many of you have you heard of St Michael’s Mount, a similar island, with a similar path that is covered by water at high tide, but in Cornwall and not in Normandy? Smaller than its “sister” in France, the rocky island is home of a medieval castle and a church, with a few houses and a harbour at the bottom which now are under the wing of the National Trust. There are 30 people who call the island their home, who work and live on it whilst their children travel to the mainland every day to go to school. When you visit the island, you can talk to the locals and find out what are their struggles but also what makes them happy and how they’ve created a strong, united community that helps each other in times of storms, when no boat dares to venture towards the mainland. The island is accessible by foot, on a manmade path, when the tide is low, or by boat when the tide is high. Before venturing on foot make sure you know what time the tide is going to return, as it does quite fast and you don’t want to be caught midway. You can check the Causeway opening times here. Also, make sure to check the opening times of the castle and the beautiful Victorian gardens, as they are closed on certain days. The entry fee to the castle for one adult is £10 and for one child is £5. Even if you can visit the castle on the inside, remember that it is still the home of the St Aubyn family, who manages the island together with the National Trust. There is a big parking on the field just outside Marazion and the fee is £5/day. 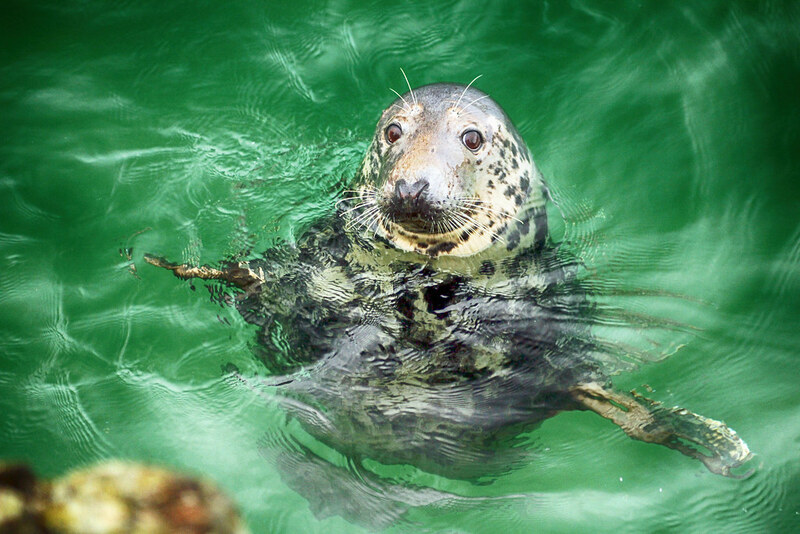 St Ives is a charming little town with golden sands beaches and a cute little harbour where, if you’re lucky, you will meet a coupe of sneaky seals. They will approach the concrete wall and do tricks in return for fresh mackerel. It’s a great deal for both them and the fishermen selling mackerel directly from the anchored boats nearby. If you want to see more seals, take a 6km boat trip to the Seal Island, where around 40 of them are sunbathing lazily on the rocks. 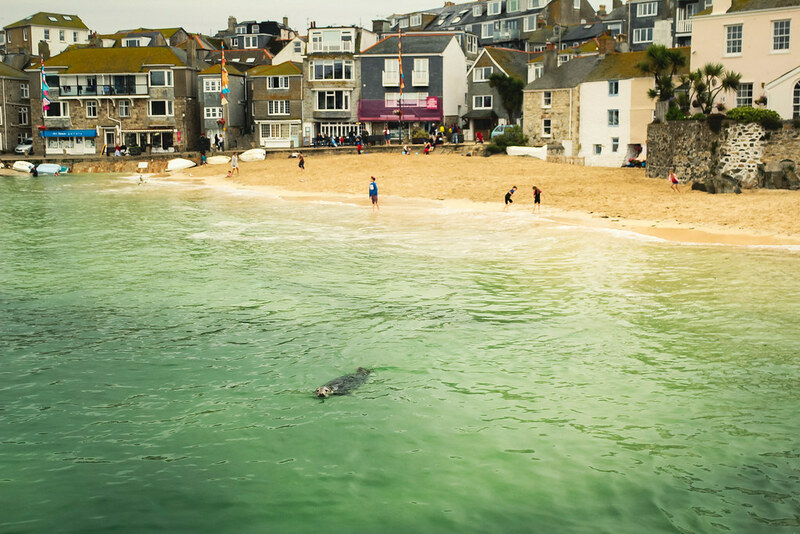 St Ives is also a very artistic city, with plenty of galleries and exhibitions open all year round, and a sculpture garden featuring works of many famous artists of the 20th century. Did you know that there is a Tate Gallery in St Ives, besides the two in London and the one in Liverpool? 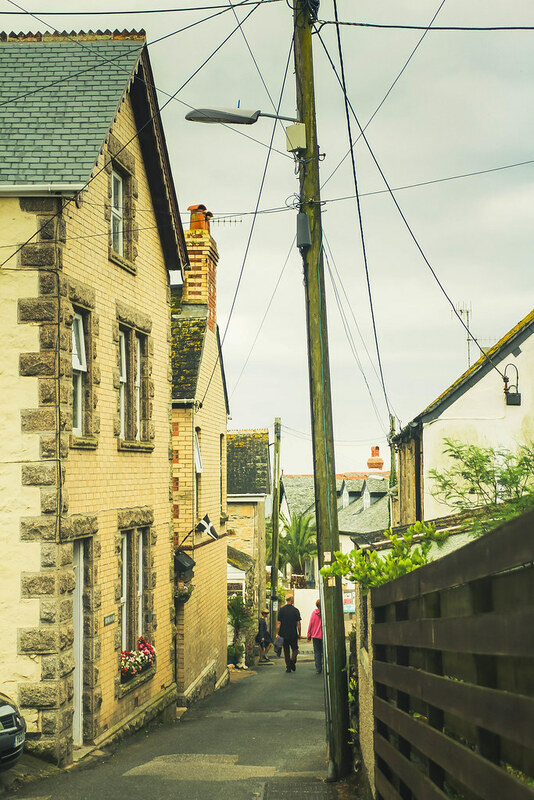 The heart of St Ives is a labyrinth of tiny old cobbled streets alongside fishermen cottages and many independent shops, restaurants and guest houses. Even Virginia Woolf was inspired by St Ives who write “To the Lighthouse” inspired by the Godrevy Lighthouse, which you can admire on its little island, from St Nicholas Chapel. If you are brave enough, you can take a few lessons and learn how to surf in St Ives, from the local surfing school. St Ives is also a great place to try the famous Cornish Pastry, with plenty of shops selling it as a take away snack. And it’s good, it’s really good! I bought one and ate it whilst sitting down on a bench, looking at the harbour panorama and at the seagulls trying to find their balance on the tiny boats. If you like hiking on the cliffs and be surrounded by surreal scenery, then you should definitely add Lizard Point to your Cornwall itinerary. 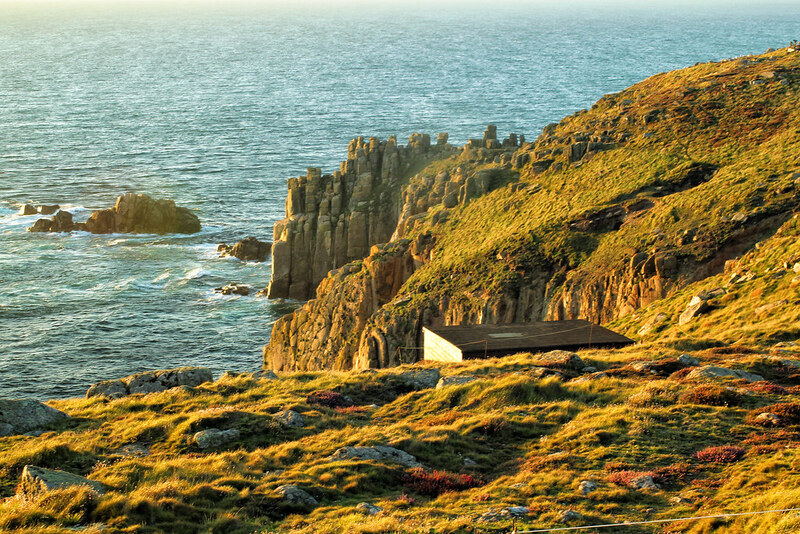 The Southern end tip of mainland Britain, Lizard Point is a National Trust protected sight. Famous in the past for the many ships that sunk here, the area is today a wonderful complex of unique flora and wildlife. As I arrived at the observation point I noticed two members from the National Trust setting up tripods with binoculars on it. Through them, I could notice seals lying in the sunshine on the rocks close to the shore. Depending on the time of the year you can also see sharks and dolphins. Probably the most exciting thing to do at Lizard Point is to hike towards Kynance Cove. The 2 miles hike is quite easy and very rewarding, with stunning views over the azure coloured sea and the dramatic cliff coast line. If you are brave (I was not), you can try to climb down towards Landewednack Beach, a stunning remote area where you probably won’t find many people. I was too scared to find my way down because I am afraid of heights and the path didn’t look very well maintained. However, there were people down there. If you decide to attempt, just be careful! In summer, on hot days, be careful when you climb on the stones to take photos, as adders can be sunbathing there too. If you are a member of the National Trust, there is a free parking for you just next to the Lizard Lighthouse. I am not a member, so I parked in the village, for free. I am not sure if there is a charge or if it was free because it was bank holiday, so be sure to check before you leave your car. When Kynance Cove first came into my sight, as I was hiking from the Lizard Point, I immediately thought of it as a scenery from Thailand, and not from England. It was so beautiful, with such a pretty turquoise color of the sea. Unfortunately, the beach has been suffering from overtourism, and this is a problem, especially when at the end of the day the stunning beautiful area is left behind swimming in piles of garbage. I was there a few years ago and whilst it was still pretty full, it wasn’t as bad as I am reading it is these days. Unfortunately, there are people who can’t enjoy what nature is offering without scribbling their names on rocks, throwing bags in the sea or leaving their trash on the beach. Kynance Cove is a small beach and shrinks even more when the high tide comes. So much that the access from the little café to the Coastal path can get covered with water. As a responsible traveller I can only recommend you to visit Kynance Cove outside the touristic season. 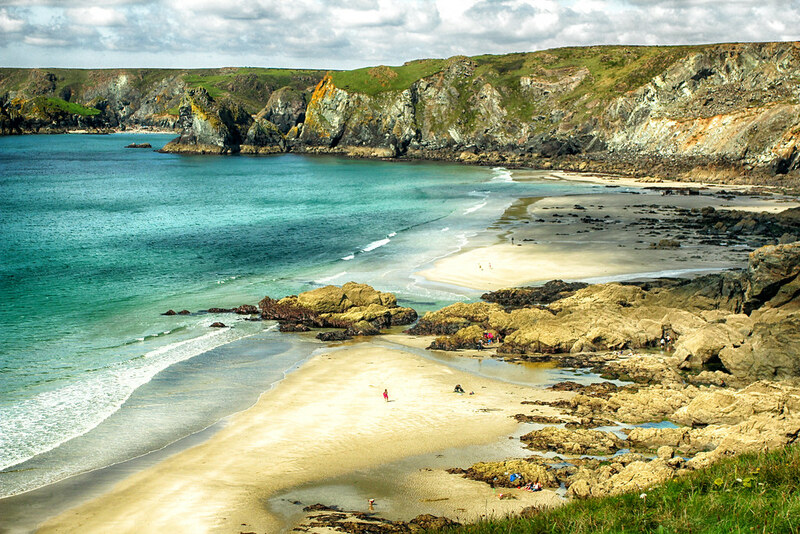 Buy lunch at the café from Kynance Cove instead of bringing your own food from home. Hike instead of driving all the way up to the parking lot on the top. 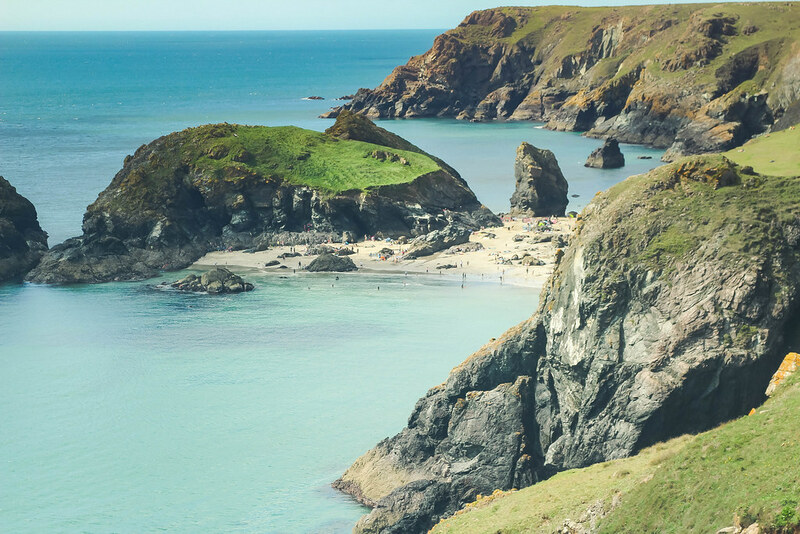 Support the local community so that they can continue to take care and maintain Kynance Cove, so that you and me can return to it one day and still enjoy it as it used to be: a little paradise. 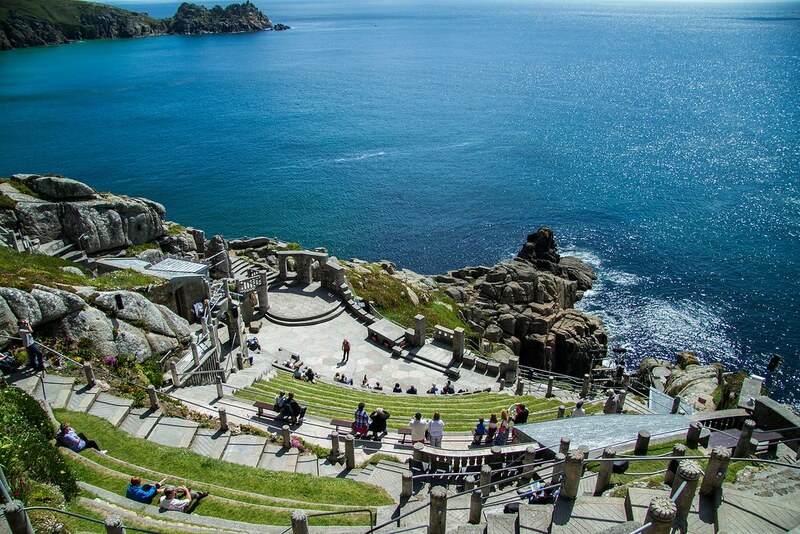 A unique outdoor theatre, Minack is situated on the cliffs overlooking Porthcurno Beach and the sea. The independent venue is run by a charitable trust and finances itself exclusively through selling tickets to the performances and through its giftshop and café. As a local business, it also employs around 50 people through the summer season so don’t miss out on visiting the theatre at least, if you don’t have time to attend a play. There are different performances at Minack Theatre, from classic Shakespeare plays re-invented for modern times to musicals, from amateur productions to children’s plays, from symphonic concerts to morning family storytelling events. The price of a ticket for a performance is £14 for an adult and £7 for a child under 16 years old. 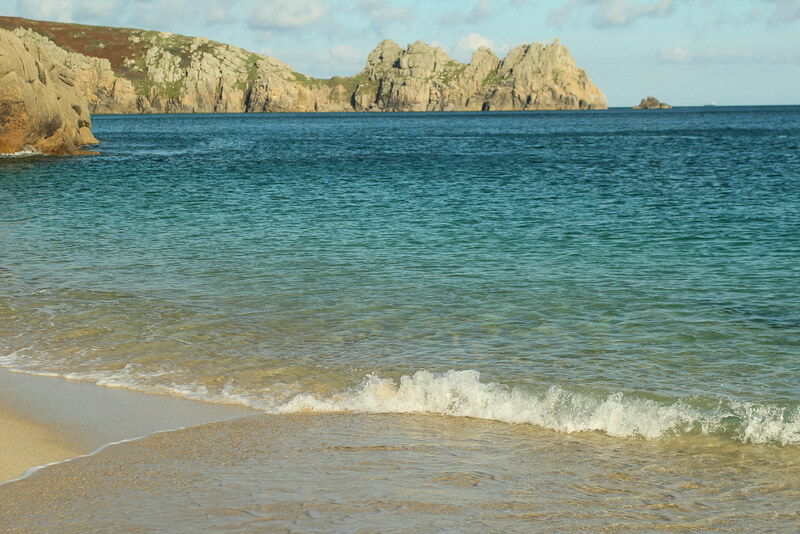 Just below Minack Theatre you will find Porthcurno Beach, a stunning cove with white sand surrounded by high cliffs. There is a way down from the theatre to the beach but it’s very steep and dangerous, so please do take the official road down. The photo above of the beach was taken seconds before a wave swept me off my feet and I fell into the cold water. I was at Porthcurno at the end of August and even if the weather was sunny, it was the first day when the rain stopped, and the temperature was quite low. As I got up from the sea trying my best not to get my camera wet, I noticed that my jeans were completely drenched, and I was shivering. As the car was parked up the cliffs, next to Minack Theater, it felt like forever to reach it. And then, even more embarrassing, I had to change my wet jeans in front of the crowd waiting to get in for the evening theatre performance. And from this story comes my advice: do not forget to take a change of clothes with you when you go to the beach and do not attempt to get in the water “just up to my ankles” when you are wearing jeans. 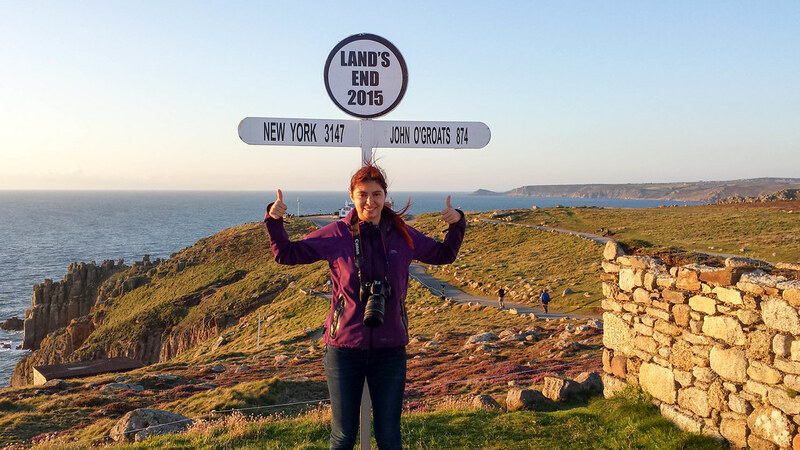 Land’s End… or where England ends. Many people have told me not to go there because there is nothing to see, just a very expensive car park. And they were right. There is nothing to see if you go at the wrong time of the day. But I was there for sunset. I parked the car about one kilometre before Land’s End, on probably the only stretch of road that didn’t have double yellow lines on it. When I returned two other cars managed to squeeze in that tiny space as well. Parking at Land’s End costs £6! When you first get to Land’s End you are greeted by a large Visitor’s Centre which to be honest I didn’t find very interesting for me. Maybe for a family with children it would be a different story though. I passed by quickly through it as most of it was closed anyway by the time I got there. I hurried to take a photo with the land post and then took a stroll to enjoy the sunset. From reading reviews on Tripadvisor I’ve noticed that there is a steep price to pay for a photo with the post, £18, and you are not allowed to do it with your mobile phone. However, I guess that because I was there after everything closed, there was nobody to charge or stop me taking a photo with the mobile phone. Many people seem to have a bad experience at Land’s End and because of this I can’t really recommend it. Based on my own experience however, if you want to enjoy it without the crowds and without being pushed to pay for everything, go in the evening, after 6PM. 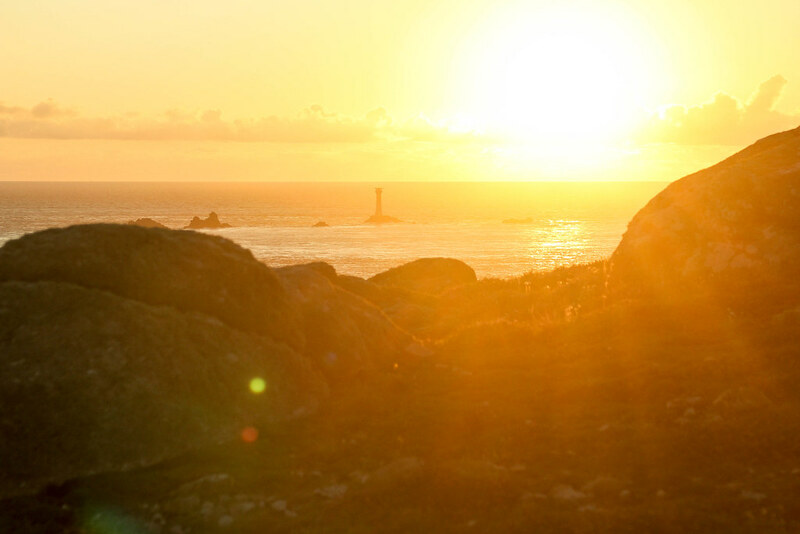 I had a pleasant time at Land’s End and really enjoy the sun setting over the lighthouse at the horizon. 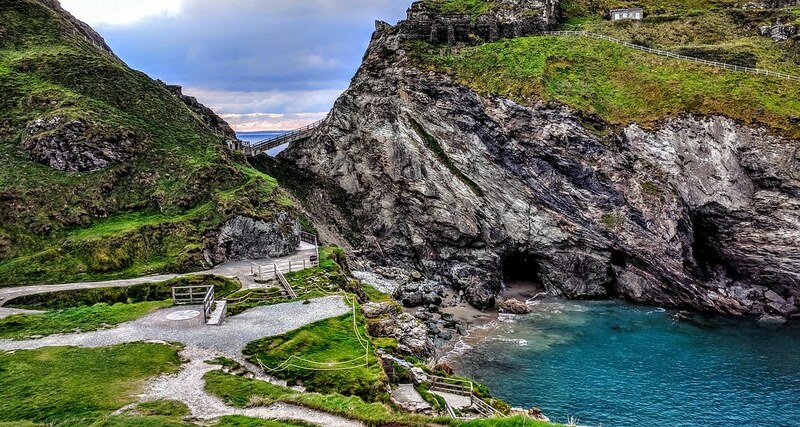 If I had an extra day I would have loved to explore Tintagel and go on a mythical search for the legend of King Arthur. I would have loved to walk through the remains of a medieval village from the dark ages, cross the bridge to the island and enter on the wooden door that leads to the castle, imagining how life would have been back then. The ruins of the castle are set on the dramatic coast with stunning sea views. Down on the beach, rumours say there is the cave of Merlin himself. Dare to find it? 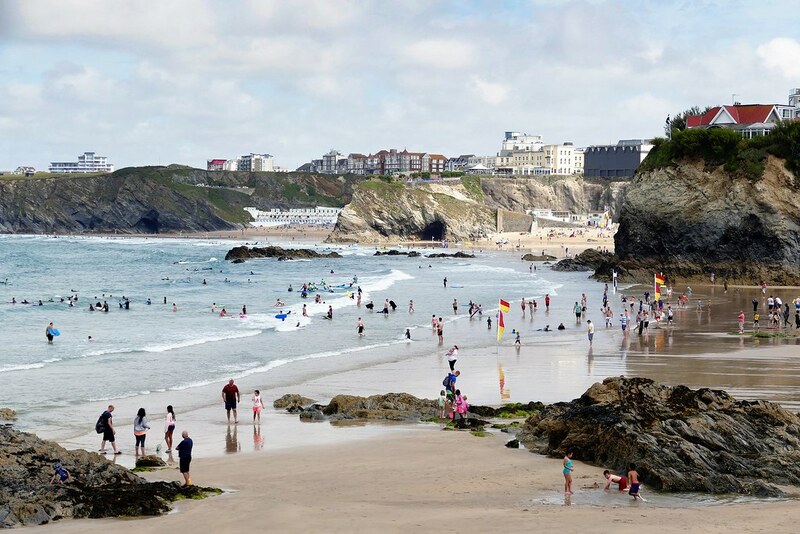 If you love surfing then you should add to your visit the surfing capital of England, Newquay! Here, the strong currents of the Atlantic Ocean create powerful waves, perfect for surf and other water sports. You can choose from plenty of water related activities, such as learning how to surf, Waverunner safari, where you will tame the waves on board a powerful jet ski, sea safaris, where you will spot dolphins, seals and enjoy the marine life, fishing excursions or coasteering. The Eden Project is a massive complex that tries to recreate different climates of this world inside two huge hexagonal domes. One of them is simulating a rainforest environment whilst the other a Mediterranean one. Outside, there is also a large botanical garden with many plants native to Cornwall but also with some that have a prehistoric heritage. 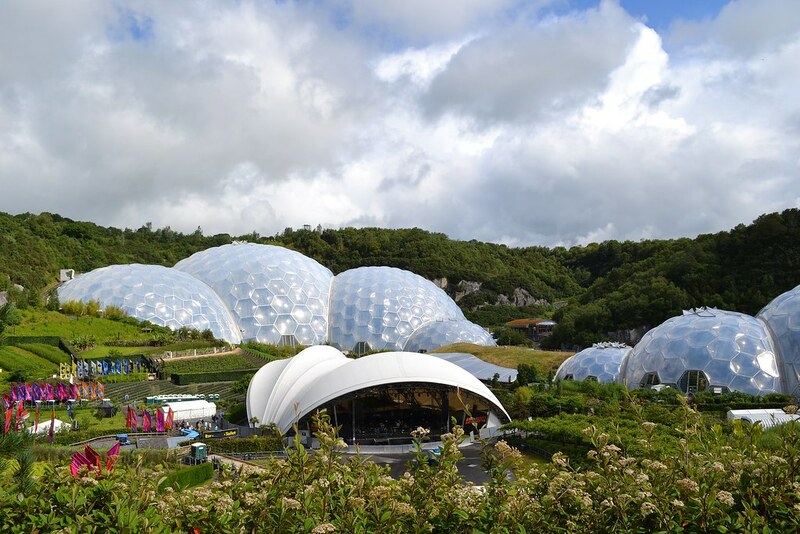 The Eden Project is perfect for an educative day out, especially for children. Fun fact, every year the Eden Project hosts a series of musical performances with big artists on the headline. This year’s line-up included Gary Barlow, Bjork and Massive Attack. 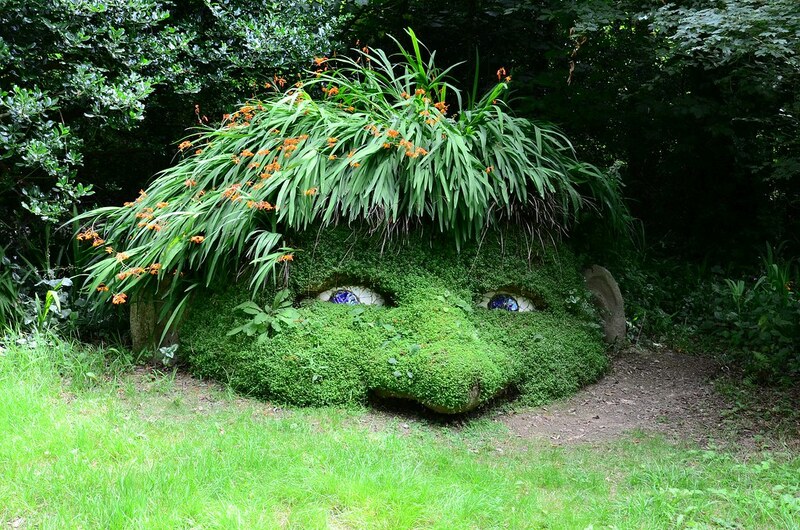 If you want to explore a botanical garden with a twist, then the Lost Gardens of Heligan is the perfect choice. You will find here the only outdoor jungle garden in Cornwall, with Burmese Rope Bridges, tunnels of towering bamboo and exotic trees such as bananas and rhubarbs. The Woodland Walk is full of surprises. Walk the 200 years old path and search for the iconic Heligan sculptures: The Giant’s Head, the Grey Lady and the Mud Maid. In spring, the path gets surrounded by a carpet of bluebells. Are you a fan of Harry Potter? Then you should add to your Cornwall Itinerary the Museum of Witchcraft and Magic from Boscastle. Here you will find the largest collection in the world of objects that were used to perform witchcraft in the past. The museum started as a private collection, in 1951 and was founded by the English folk magician Cecil Williamson. Back then, it even had its own resident witch! There are also over 7000 witchcraft books in the private collection of the museum, which can be seen by special appointment. Have you ever visited a tin mine before? Or any type of mine, in fact? If you are looking for a different type of experience that involves strict regulations, wet and muddy conditions, tight spaces and a bit of adrenaline, then this is the perfect place. There are only a few tours a day and the mine is only open during summer, so make sure you check the schedule and book your visit in advance, before you arrive. This place has nature all around in its bright and vibrant colors. Wish to visit some day and to enjoy the bounty of nature and amazing food that this place to offer. 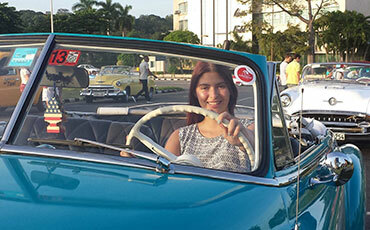 Thanks for sharing such a great travelogue. We went to Cornwall earlier this year and it’s such a wonderful place. We went to Tintagel already, but so many of the places on your post are places I want to visit. What a wonderful itinerary. We love Cornwall and are off there in a week or so, I’m hoping to get to The Lost Gardens of Heligan as it’s somewhere we’ve yet to do. This is great, I wasn’t able to travel this summer but keeping this for next time. 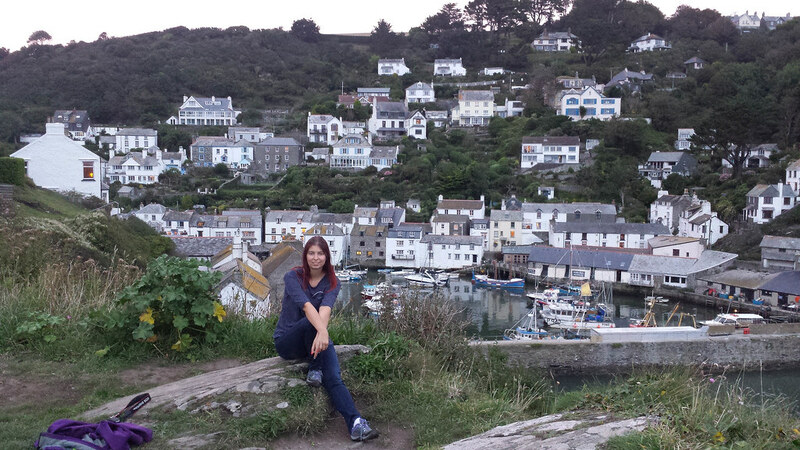 Polperro looks beautiful. 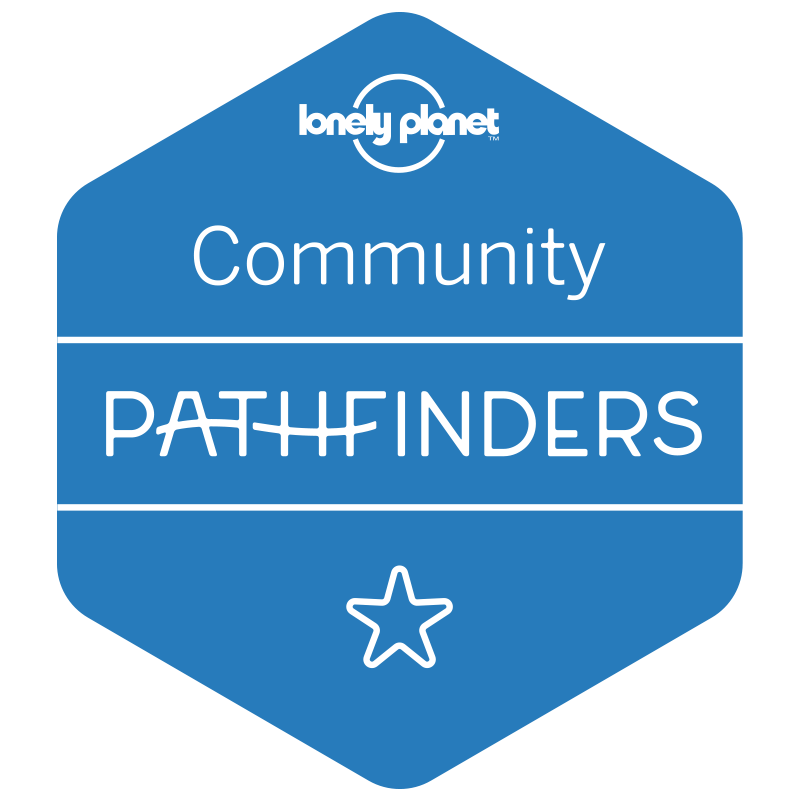 Thanks for the itineary lists of places. Cornwall sounds like a lovely place. 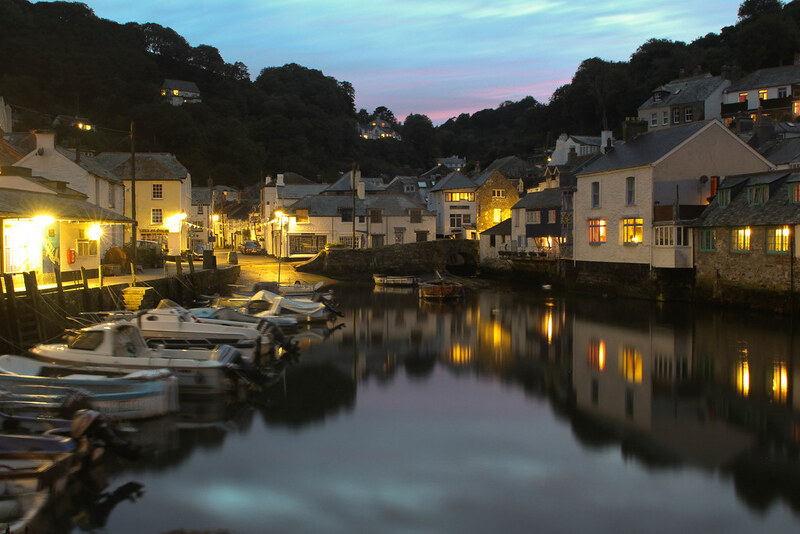 But Polperro is the one where I wanna go even for 2-3 hours, it looks much peaceful. Then comes the Eden project. Hope you had fun at there. But Finance is the main problem, otherwise if travel was free, I would have gone anywhere. Cornwall looks like an amazing place to visit! All of your photos make it seem so beautiful, and there were a ton of places to go and things to see! That theater looks amazing, and all the beaches seem like paradise to me! Goodness gracious! I would never mind the bad roads that lead to such a magical place!Cornwall is so beautiful oh my! The national park, the beach and the lost gardens look so breathtakingly attractive dear! These pictures are great! I Love seeing other places around the world in photos, although I am not much of a traveler. Thank you for this post! it’s so great and the photos are gorgeous! i am going in cornwall in september so now i have ides of what to do and where to go! The Eden project looks way cool. Do they allow you to go inside the domes? Yes, it’s a botanical garden. what a gorgeous place in this world! I would love to visit one day! so many great things to do! Thank you so much for sharing this with us! Cornwall sounds like a great place to visit. I need to make it here one day. I would love to go to the botanical garden! such beautiful scenery. I’m wishing for long walks, easy boating afternoons, dinner on the patio … yeah, I think I need to visit Cornwall. Nope. I need to move there. What a beautiful place! Cornwall is definitely on my bucket list and your itinerary is perfection! Such a beautiful place to visit and I can really see that there’s a lot of fun activities, adventures and memories that you can make in this place. I will be in the UK next month for the first time and I am so excited! 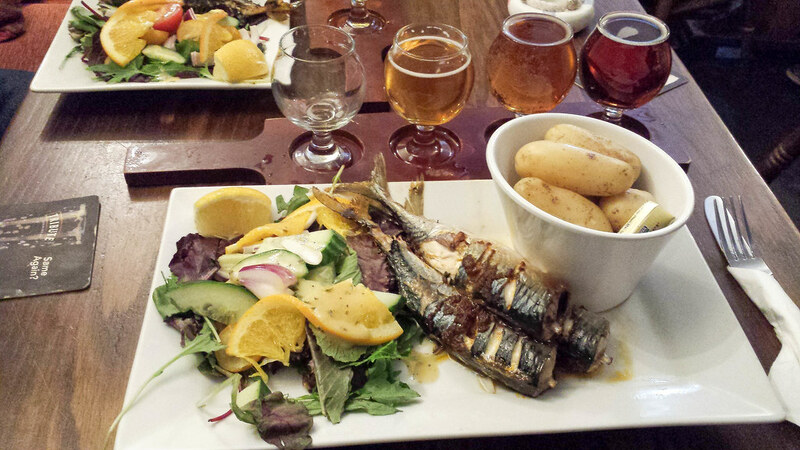 Cornwall is not on the itinerary, but your post is making me wish I had more time to visit! Okay, I both love and hate this post at the same time. I love it because everything about it is perfect, but I hate it because I was planning to write a Cornwall post soon and everything on my list features here already. Plus your pictures and your writing are better than mine! My parents moved to Looe four years ago, so I come here every summer and absolutely adore Cornwall. This is so helpful. We’re heading back to Cornwall later this year having already spent a week there at the end of July. I’ll be sure to put some of these places on our list! I’ve wanted to go here for ages! Hope to be able to tick it off the list soon as it’s not ridiculously far from me. Lizard Point looks great. I have only been to St Ives and Land’s End on this list. I never knew there was so much to see in Cornwall. You need like a whole week just to see everything. Thanks for the tips as I will definitely be back. I had my first glimpse of Cornwall from Poldark but you’ve given me some ideas about actually seeing this for myself. Thank you for the wonderful tips and amazing pictures. The scenery in Cornwall is just stunning. I am hoping to visit next year. Thanks for sharing so many cute towns, I want to visit them all. I hadn’t heard anything bad about Land’s End so surprised to read that. This is such a handy itinerary! I went down to Cornwall a few times when my friend and her family moved there but haven’t been back for years and never really got to explore too much. It is definitely somewhere I would love to go again – and take the children too – especially as it is such a beautiful part of the country. I’ll definitely be checking out some of the places you suggested when we do go. 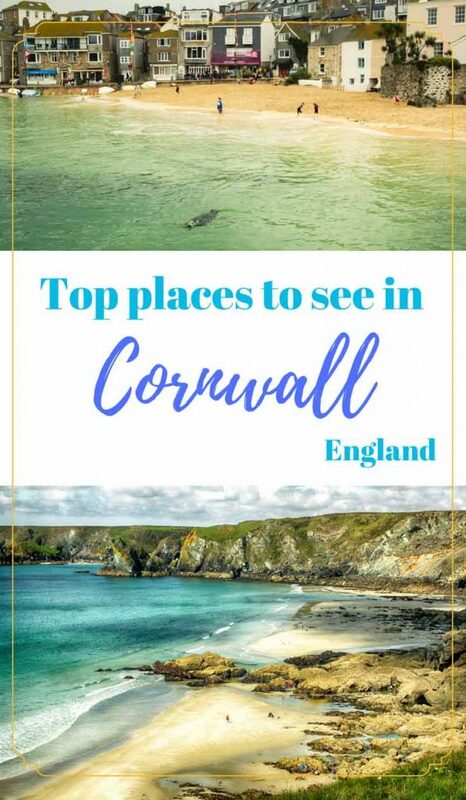 Totally loving all your photos and tips on where to visit in Cornwall, its been a good few years since we visited the place and this is a great guide and your itinerary is so precise. I have not been to Cornwall yet, but I really really want to go – hopefully next summer with the children. I’ve only ever been to Newquay in Cornwall, which I loved, but I’m so keen to explore more of it because it’s so beautiful! Cornwall is one of my most favourite places to visit! It literally feels and looks like it’s a whole world away from the UK it is just breath taking! Great post! I’ve never been to Cornwall but now I really must go.